A strongly-argued critique of environmentalism from the right--the conservative's answer to Al Gore's Earth in the Balance. 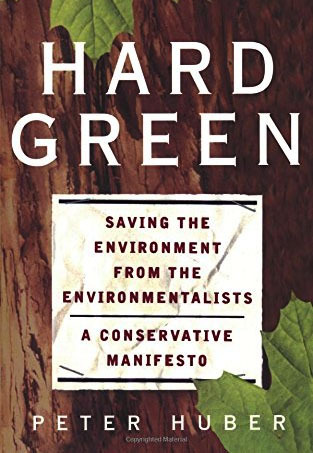 This book sets out the case for Hard Green, a conservative environmental agenda. Modern environmentalism, Peter Huber argues, destroys the environment. Captured as it has been by the Soft Green oligarchy of scientists, regulators, and lawyers, modern environmentalism does not conserve forests, oceans, lakes, and streams-it hastens their destruction. For all its scientific pretension, Soft Green is not green at all. Its effects are the opposites of green. This book lays out the alternative: a return to Yellowstone and the National Forests, the original environmentalism of Theodore Roosevelt and the conservation movement. Chapter by chapter, Hard Green takes on the big issues of environmental discourse from scarcity and pollution to efficiency and waste disposal. This is the Hard Green manifesto: Rediscover T.R. Reaffirm the conservationist ethic. Expose the Soft Green fallacy. Reverse the Soft Green agenda. Save the environment from the environmentalists. “Right on Green: Toward a conservative theory of environmentalism” by Robert Royal, The Weekly Standard, March 20, 2000.